Don't Let Your Accent Derail Your Career < Presenting Yourself and more . . . But making your way in a different culture poses unique challenges when you are required to speak in a foreign language. Your accent may hold you back. Over the years, as a former speech pathologist and now a presentation and media coach, I have worked with executives from many countries to help them be understood by American audiences when making a presentation, giving a speech or meeting with a reporter. It’s unfortunate, but if a speaker has a very heavy accent, people tend to tune him out. Foreign executives working in the U.S. are very self-conscious about their accents, which may cause some Americans to think they’re stupid. While that’s certainly not true, many foreign speakers have told us they feel that they are looked down upon. But it is true that if someone has an accent that keeps an audience from hearing her message, she will need to work on improving her pronunciation so that she can be understood. Speakers should find words they can pronounce to substitute for the ones they can’t say but mean the same thing. When making a presentation, it’s best not to wing it but rather to use a script with problem words written phonetically. Build in pauses (mark them in the script) especially before tackling a particularly difficult word. Slowing down and enunciating words carefully will also help. If someone doesn’t understand a word, the presenter should talk around it or rephrase what he just said. Practice is essential. One of my first accent reduction clients was an instructor from Japan who was working at an American university. He was very frustrated because his students couldn’t understand him. He confided that the only time he practiced English was during his two hours of training every week! Accent reduction takes time and practice. A speaker needs to make a priority of speaking English in safe settings like at home, or when shopping and meeting with friends. Be supportive when talking with a person who has English as a second, or even third, language. Help him out. Correct him only if asked. You might say, “I had the same problem when I was working in your country. The word you’re looking for is…” As a listener, remember the foreigner has good hearing and increasing your volume when speaking to him won’t help him understand you any better! Give foreign employees a grace period and don’t expect perfection. Be understanding and realize that foreign language speakers are very self-conscious. If you’re the person’s manager, take into account that the employee is working in a very different culture and has a lot of things to get used to. The changes can be overwhelming and diminish her productivity. Often the executive will come from a country where it is considered bad form to be assertive. So encourage her to express her point of view, even it makes her a little uncomfortable at first. Many people from Asian countries have difficulty making sustained eye contact. That’s a part of their culture. It shouldn’t be taken as a signal that they’re trying to hide something or are being evasive. If you’re being transferred to another country, make an effort to understand the culture. You don’t want to offend. For example, in many European countries, giving chrysanthemums as a gift is frowned upon because that flower is associated with death. Speaking with an accent in a second language shouldn’t be a liability. 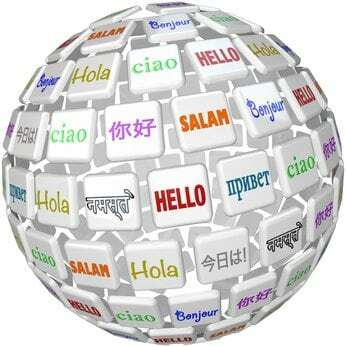 In fact, people admire foreign executives who can speak more than one language, a skill that eludes many Americans. By virtue of having worked in another country, foreign speakers bring invaluable experience to their jobs. They most likely know more than the person sitting opposite them who doesn’t have an accent or a global perspective. So the next time you meet someone from another country, take the opportunity to learn from them. A great blog, especially with our global business village getting smaller and smaller. I think an interesting blog would be a discussion of some of the cultural differences among the G-8 countries, such as what chrysanthemums mean in many European countries and the avoidance of eye contact in many Asian countries, a behavior that we preach and hold as gospel.